"Are you willing to devote your life to telling stories?" IFC Films has debuted an official trailer for the film Rebel in the Rye, an indie drama which first premiered at the Sundance Film Festival earlier this year. The film stars Nicholas Hoult as famed author J.D. Salinger, telling the story of his early years, his time fighting in WWII, and his pursuit of a love interest. It also shows how the success of his novel, Catcher in the Rye, turned him into a recluse, staying out of the public for the rest of his life after it was published in 1951. The cast includes Zoey Deutch as Oona O'Neill, Kevin Spacey, Lucy Boynton, Sarah Paulson, Victor Garber, Hope Davis, Amy Rutberg, James Urbaniak, Celeste Arias, and Eric Bogosian. This received dismal reviews at Sundance, and not so surprisingly the trailer doesn't look that great either. 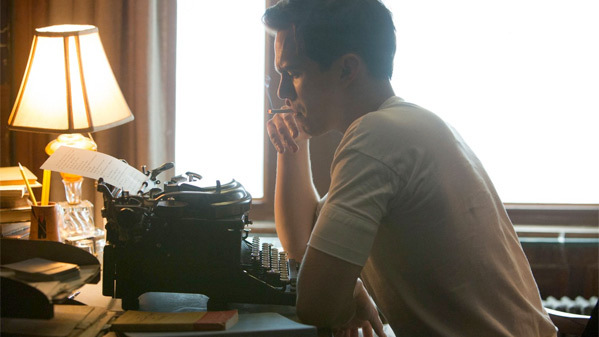 Rebel in the Rye follows a young J. D. Salinger (Nicholas Hoult) as he struggles to find his voice, pursues a love affair with famed socialite Oona O'Neill (Zoey Deutch), and fights on the frontlines of World War II. It’s these experiences that will inform the creation of his masterpiece, The Catcher in the Rye, bringing him overnight fame (and notoriety) and leading him to withdraw from the public eye for the rest of his life. Rebel in the Rye is both written and directed by American actor-turned-filmmaker Danny Strong, making his feature directorial debut after a few episodes of "Empire" previously. It's adapted from the novel "J.D. Salinger: A Life" by Kenneth Slawenski. This first premiered at the Sundance Film Festival earlier this year. IFC Films will open Strong's Rebel in the Rye in select theaters starting September 15th this fall. Curious?